The intrigue and excitement of fire is universal. In the last 5 years, more than 40 creatives from throughout the Northwest have submitted work inspired by their fascination with this incendiary element. 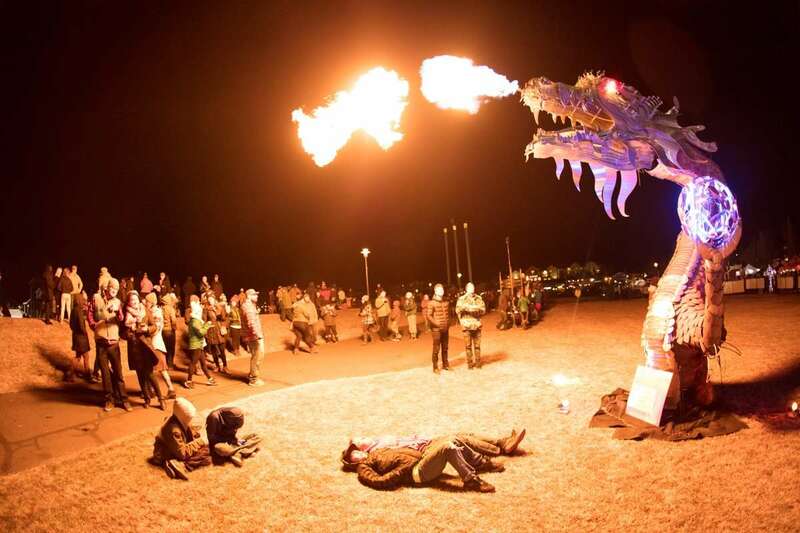 Works have ranged from innovative takes on familiar subjects — a tabletop fire pit intended for making s’mores, complete with custom forks — to fantastical spaceships and fire-breathing dragons. Equally notable are the design and sculptural based pieces, marrying form and function. As an element fire warms us, and invites us to relax, pause and socialize. 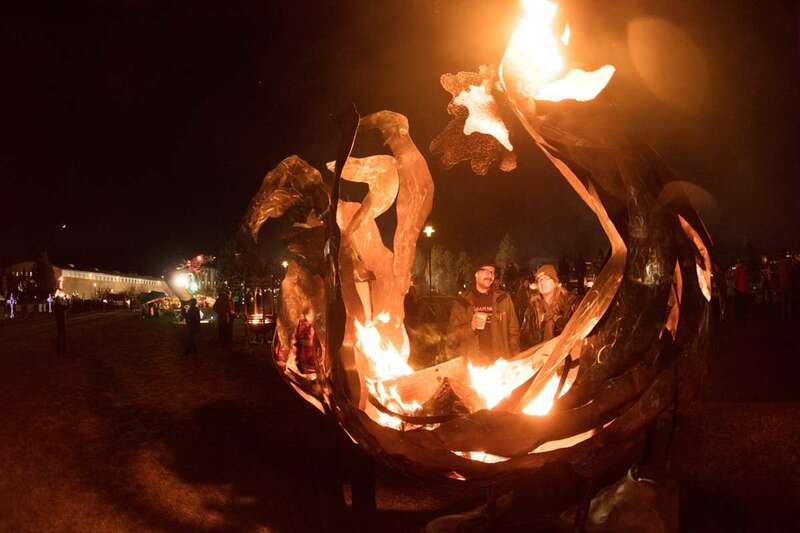 The Fire Area is a collective art installation unique to Oregon WinterFest, offering an experience unlike anything else. We are excited to welcome visual artist Miguel Edwards to the 2019 OnPoint Community Credit Union Oregon WinterFest! 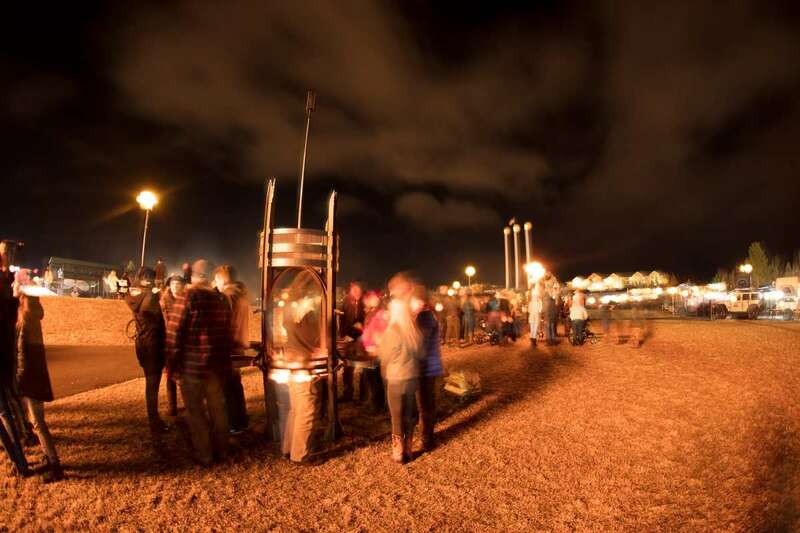 Although this is the biggest winter festival on the West Coast, Edwards’ cauldron has seen larger crowds. It debuted at the 2018 Special Olympics in Seattle, Wash. at the Opening Ceremony on July 1. 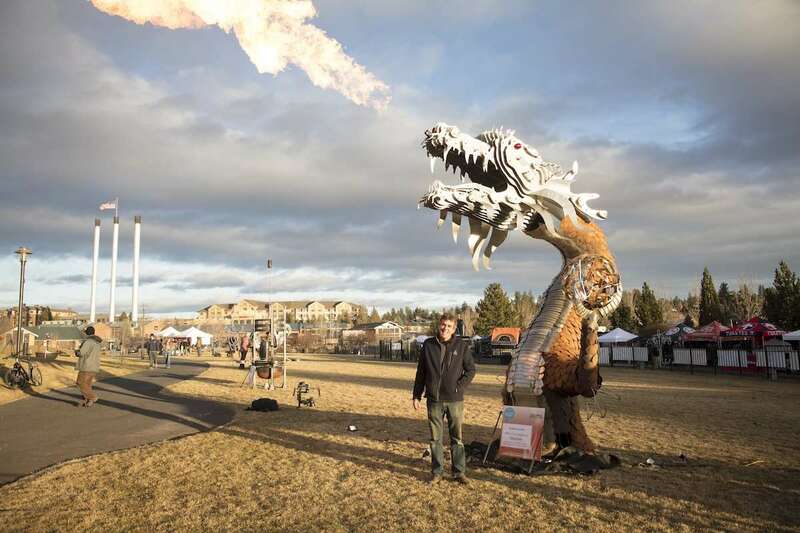 Over 39,000 people filled the Husky stadium to kick off the games and witness the lighting of Edwards’ 13-foot-tall, stainless steel tribute to the Special Olympics. 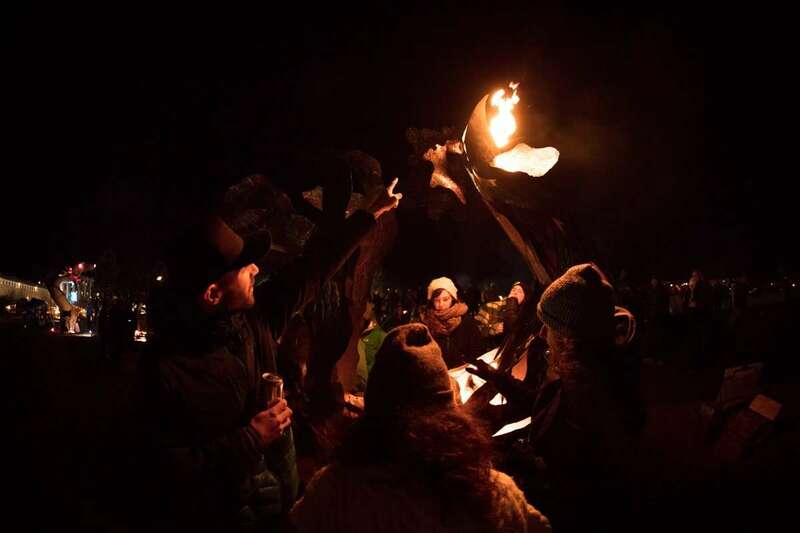 It will be lit again to celebrate the 2019 OnPoint Community Credit Union Oregon WinterFest! Edwards’s recently moved to Bend, Oregon and can be found online at www.migueledwards.com or on Instagram at @TheMiguelEdwards. 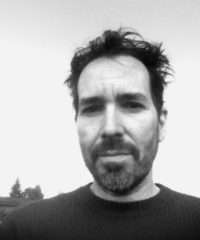 Michael Boonstra is a visual artist living and working in Oregon. 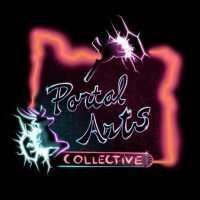 He received his BFA from the University of Michigan and his MFA from the University of Oregon. Boonstra utilizes a range of media including drawing, photography, installation, and sculpture in his current creative practice. 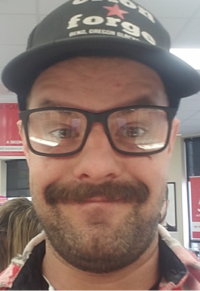 He is a founding member of Gray Space, a group of Oregon artists based in the Corvallis, Eugene and Roseburg areas who came together in 2016 to claim agency and develop projects that circumvent institutional structures. Boonstra has had recent solo exhibitions at Oregon State University in Corvallis, Oregon, At Liberty Arts Collaborative in Bend, Oregon, and Duplex in Portland, Oregon and has been awarded grants and project funding from the Oregon Arts Commission and the Ford Family Foundation. He has received Ford Family Foundation sponsored residencies at Playa and the Djerassi Resident Artist Program and has been awarded recent residencies at Caldera, Signal Fire, and Pine Meadow Ranch. 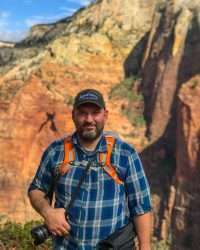 Michael Boonstra lives in Eugene, Oregon and teaches at Oregon State University in Corvallis, Oregon. 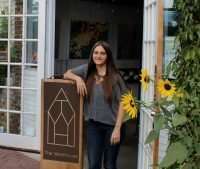 Cari Brown is an artist and entrepreneur. Her work in art related fields spans 2 decades. While she has no formal training as an artist, she has gained a broad knowledge base from trial by fire. 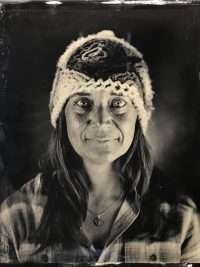 Following her passions and curiosity, her endeavors include running an independent gallery in Portland Oregon’s Pearl District, working in independent film, singing and touring the country in country bands, opening and managing a small farm to table restaurant in Brooklyn NY, and assisting several births as a Labor and Delivery Doula- writing, sewing, making jewelry and art along the way. 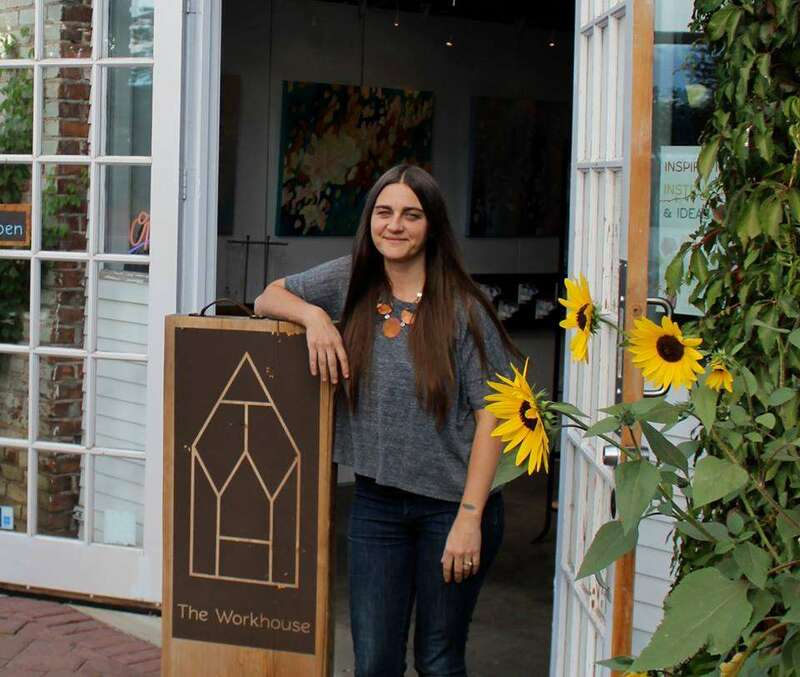 Most recently, she founded The Workhouse- a multi faceted art space in Bend, Oregon. 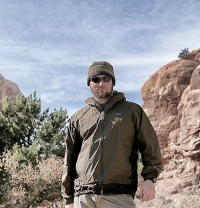 Chris Ferguson is a designer and maker from a rural community in central Missouri. He has a Bachelor of Fine Arts in Industrial Design from the Kansas City Art Institute. Ferguson has spent a majority of his professional career designing light fixtures, interiors, and furniture. In his free time Ferguson can be found exploring the outdoors, crafting furniture, making cameras, renovating homes and taking photographs. 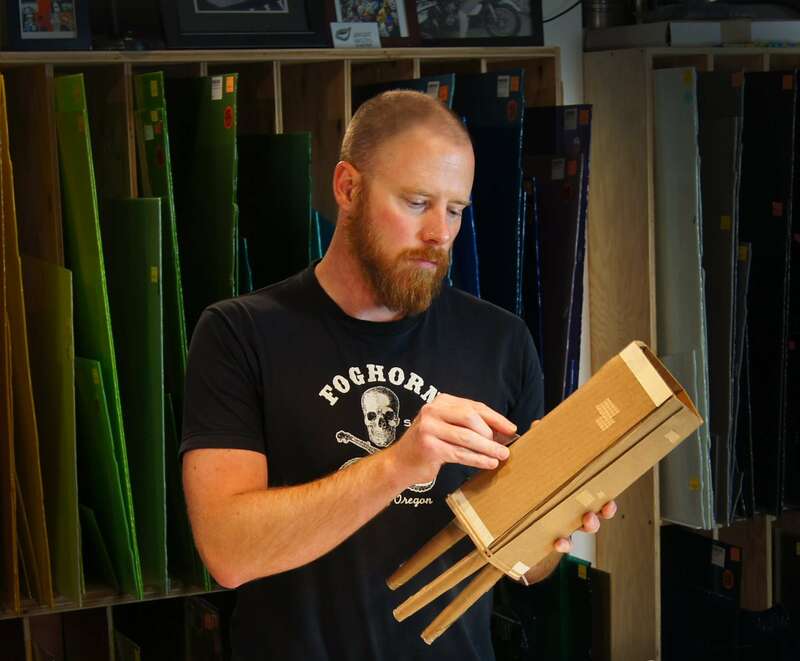 Dave and Tim have spent hundreds, maybe thousands, of hours together over the past five years creating a makerspace and artisan community in Bend. Their goal has been to build the ultimate workshop and community and make it available to everyone who wants to use it, from school kids to retirees. 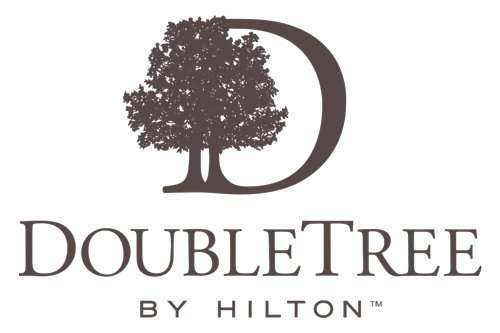 During this time together, Dave and Tim have collaborated on many creative and fun projects including a custom cider press that the community can use, a series of tiny fire pits, Adirondack chairs they gave away, DIY kegerators, and more. Many of their projects were constructed during festivals and farmers markets around town with community involvement. Their entry in this year’s Winterfest is an example of Dave’s and Tim’s collaboration in the workshop they built. Dave is crafting the wooden parts that Tim designed while Tim is creating the steel parts that Dave designed. JAY NIELSON likes his work to be impromptu, spur of the moment, inspiration driven art. 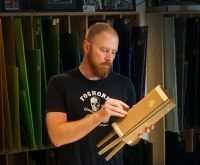 He use whatever materials he has available to create something from nothing. Jay works in scrap and reclaimed materials to prove that beauty can come from garbage. 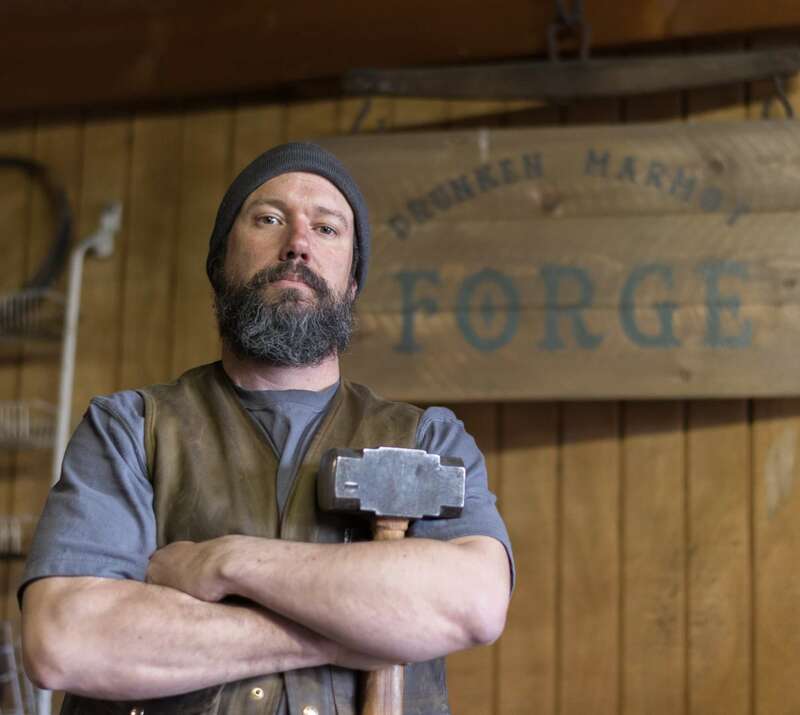 HUNTER DAHLBERG is a professional blacksmith who has been running his own ironworks shop in Bend Oregon since 2005. 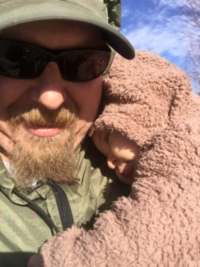 Before turning to a life of banging metal, he worked as an outdoor educator and mountain guide, where he lived in a truck and ate fried pasta. 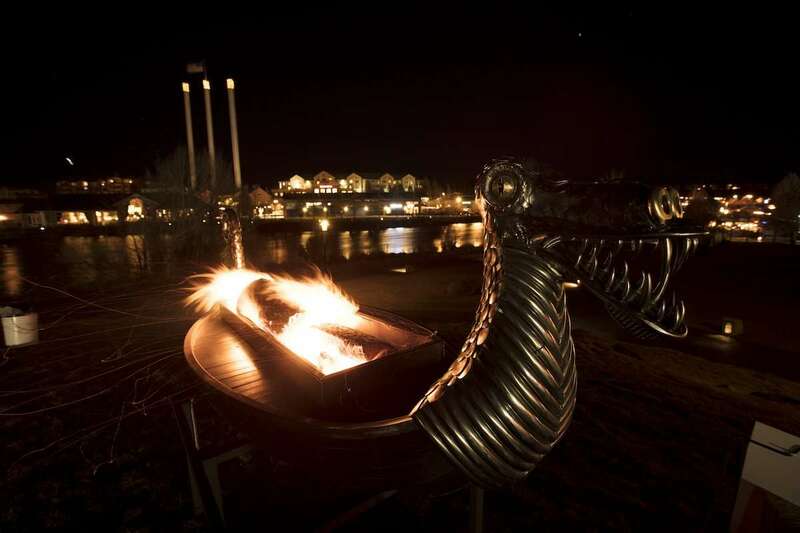 He lives and works indoors now, building architectural metal work and sculptures, including flaming ones. He has maintained his love for heavy metal music throughout his life’s transitions. Whit Poor is an artist and engineer based out of Hood River, OR. He has over a decade worth of experience in the design and fabrication industry with both national and international projects. With a knack for creative problem solving and an appreciation for the possibilities of fabrication, he started a design and production company in the fall of 2017 called 333. When he’s not in the shop you can find him with his dog Riggs enjoying the endless bounty of the Columbia River Gorge. JESSE PEMBERTON takes his multi-media sculptural background from nature’s geometric cues and textural patterns. 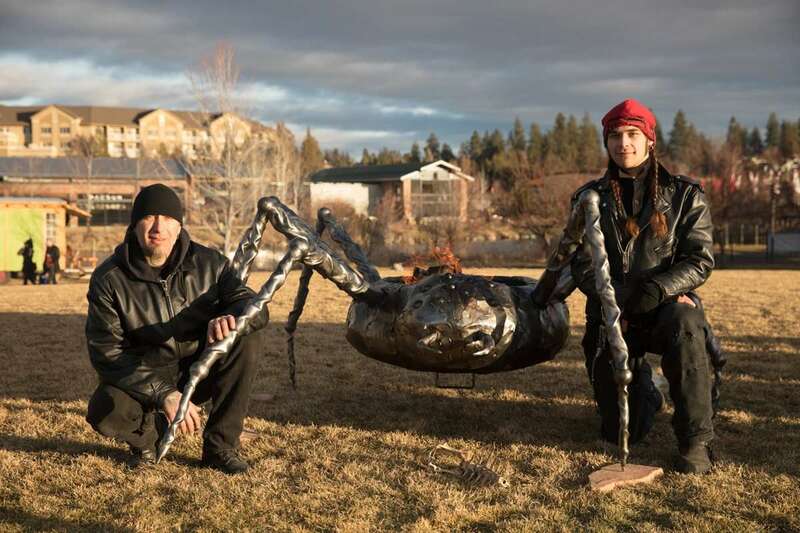 Primarily working in metal, Jesse does incorporate other found objects or local materials for his furniture and sculpture from environments that inspire him. 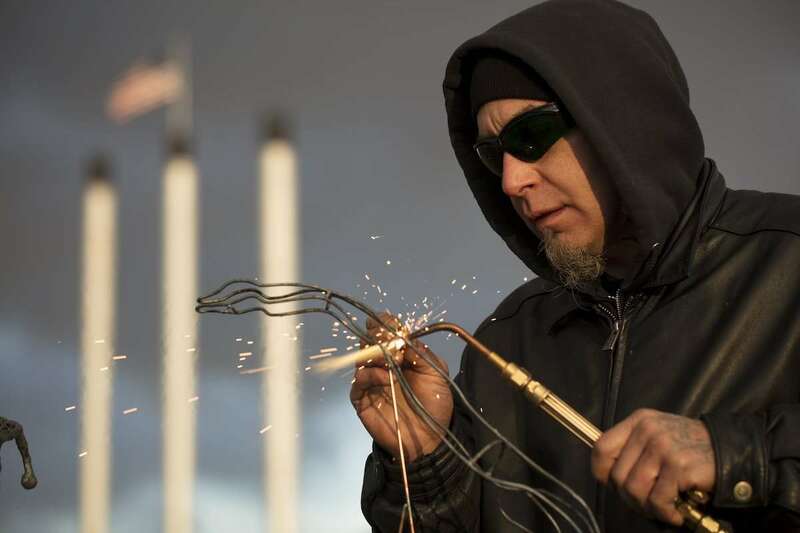 Influenced also by modern design and science, he has adapted his skill set as a professional metal fabricator to accommodate a variety of client aesthetics. Working in large and small spaces has provided him with an accomplished sense of variety in his functional and sculptural metalwork as is often the case with architectural elements. Prototyping and product/brand creation has led to several collaborations with professional designers and architects. Prior to his professional career, Jesse studied Fine Art at UC Santa Cruz (1995-99) graduating with a Bachelor’s Degree. He went on to work as a metal-smith with a private interior design & fabrication shop named ARTiFAX. Later he worked the Felix Kulpa Gallery in Santa Cruz, CA as manager and co-curator, showing some of his first sculptural series at their (4 artist) inaugural event “Retrofication” (circa 2000). Other showings of his mixed media work were included at the Cabrillo Gallery and UCSC Open Studios (1996-1999). LUKE LAWRENCE I’m Luke. I grew up in Estacada Oregon then spent my twenties searching for the meaning of life. I came back to Estacada to help out my family. My grandfather and my dad are both metal sculptors. 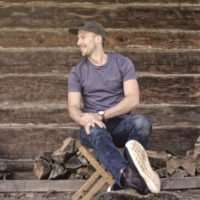 I took on my dad’s buisness, Brent Lawrence Design, and have been absorbing as much of his knowledge as possible (there’s a lot). I have developed a deep passion for art and have thrown myself into learning as much as I can. I love working with my hands and pushing my limits, turns out this is a good job for me. I’ve discovered life is more beautiful and interesting than most of us realize. The possibilities are beyond what any one human could imagine alone. I hope that what I make sparks others to create a world that is way cooler than my little brain could fathom. DYLAN SCOTT WOOCK is a designer, artist, and researcher currently living in Portland, Oregon. He attended the University of Oregon School of Architecture and Allied Arts and earned a Bachelors degree in Architecture. 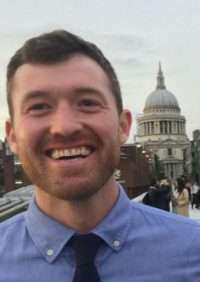 Dylan has worked and studied both abroad and locally in Vancouver, BC, Berlin, Germany, Bend, Oregon and Portland, Oregon. Dylan’s focus lies in addressing the multitude of issues brought on by climate change. He desires to translate the learned knowledge of cultures and observations of nature into contemporary design to help make more efficient and meaningful spaces and environments. Dylan currently works full time in Portland Oregon as a senior project designer for the recently formed architecture office Open Studio Collective. 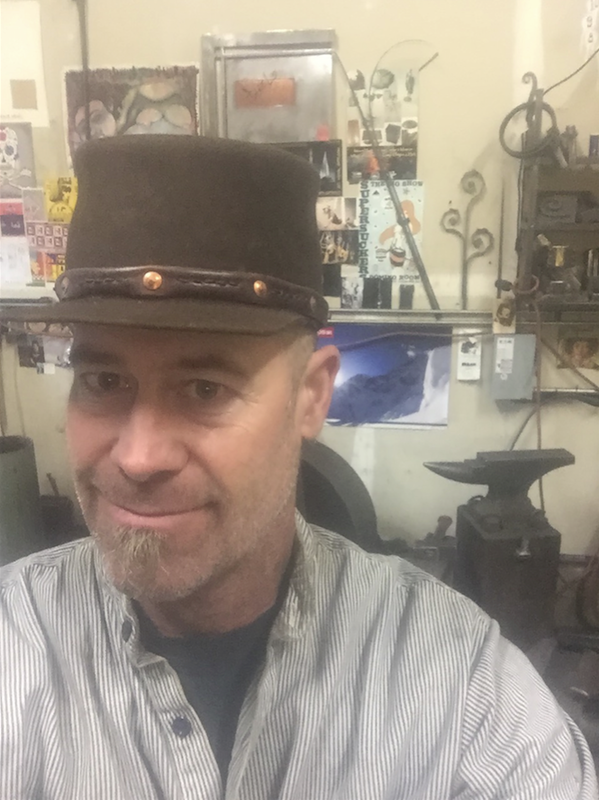 I am a local artist and owner of Weld Studio here in Bend. 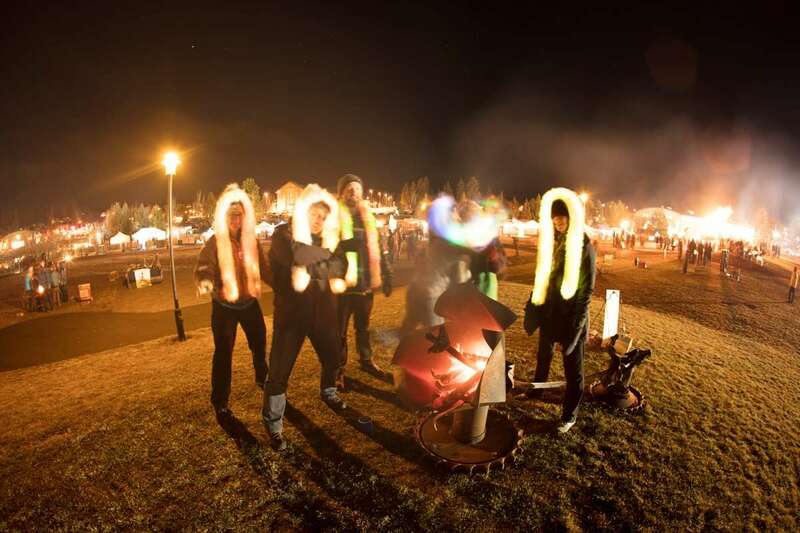 I have contributed in the WinterFest fire competition since its inception. This year I have limited my burn “canvas” to a 24” square wood burning, steel burn box. 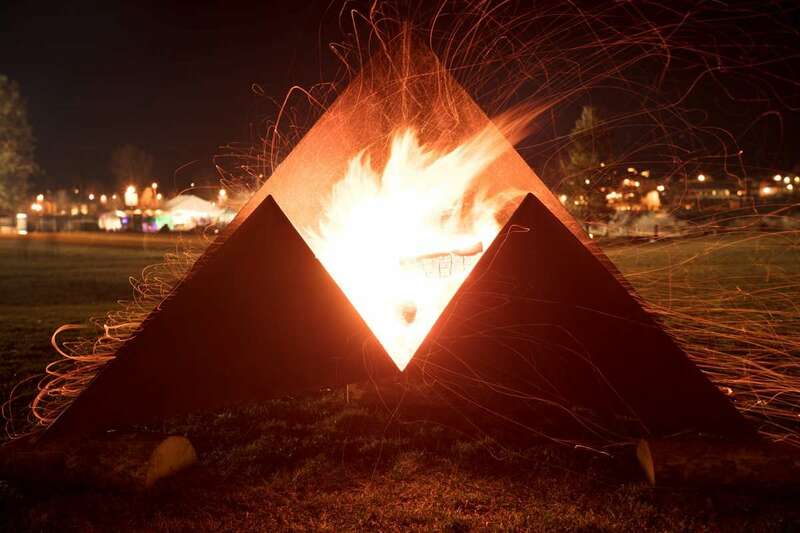 My intent is to create a fire lit lantern, incorporating the structural design components of the burn structure into the pattern layout of the lantern tower. This is a modular sculpture designed to reflect and illuminate with fire or can be re-fit with a gas burner. Stuart’s of Bend is one part artistic design, another part functional kinetic sculpture and one of the hippest fashion centers around Central Oregon. Stuart’s eye for detail, craftsmanship and unique wearable art is demonstrated in his eclectic jewelry, accessories and art found at Bright Place Gallery in Bend, Oregon. Stuart Breidenstein began his creative journey as a musician in the 1980s, then in the early ’90s he began taking fashion and design classes in Southern California. Having worked under Breidenstein Design, Go Robot and most recently, Stuart’s of Bend, Stuart brings creativity to the next level as a hub for creative innovation making jewelry, belts, art, unique camp stoves and his newest line of retro- inspired swimwear that launched in 2013. Inspired by nature, Cascadia, swimming in lakes and an eye for handmade high fashion, wearable art, Stuart’s is sure to impress and engage visitors with his unique, beautiful wearable art! 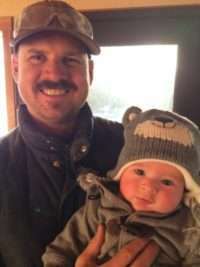 Leon Potterton is a recent retired Steamfitter, certified Welder and Weld Inspector who now enjoys having his own business working as a mobile Welder which allows him more time to pursue his artistic talents with recycled metals. 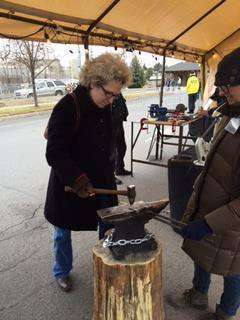 Skye Kimel is owner and operator of Downtown Ornamental Iron in partnership with her brother Josh Richardson. DOI was opened in Bend in 1985 by her father Ron Richardson. Prior to entering the family business, she gathered a BS in Environmental Science, tended bar, made pizzas and sold coffee. Skye spends her work week designing, fabricating and overseeing architectural and structural projects in Central Oregon. She spends her spare time messing around with a forge and welder and cross country skiing. 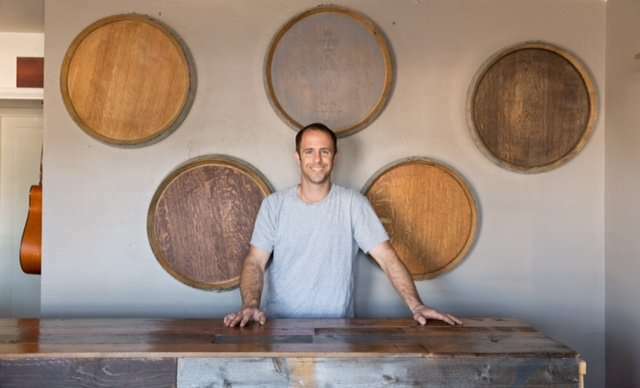 Andrew Huycke created Smokin’ Barrel Works in early 2015. 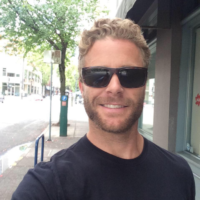 Andrew grew up in Southern Oregon and spent majority of his winter months in Bend and on Mt. Bachelor. Andrew had a great love for entertaining and knew in order to bring together friends and family, he wanted a center piece in his own home for everyone to gather around. With the combination of his enthusiasm for wine and reclaimed wood he hand crafted his first wine barrel fire pit. After creating fire barrels, he decided to branch out and use his artistic visions with furniture and décor. Andrew resides with his family in wine country in Southern Oregon. 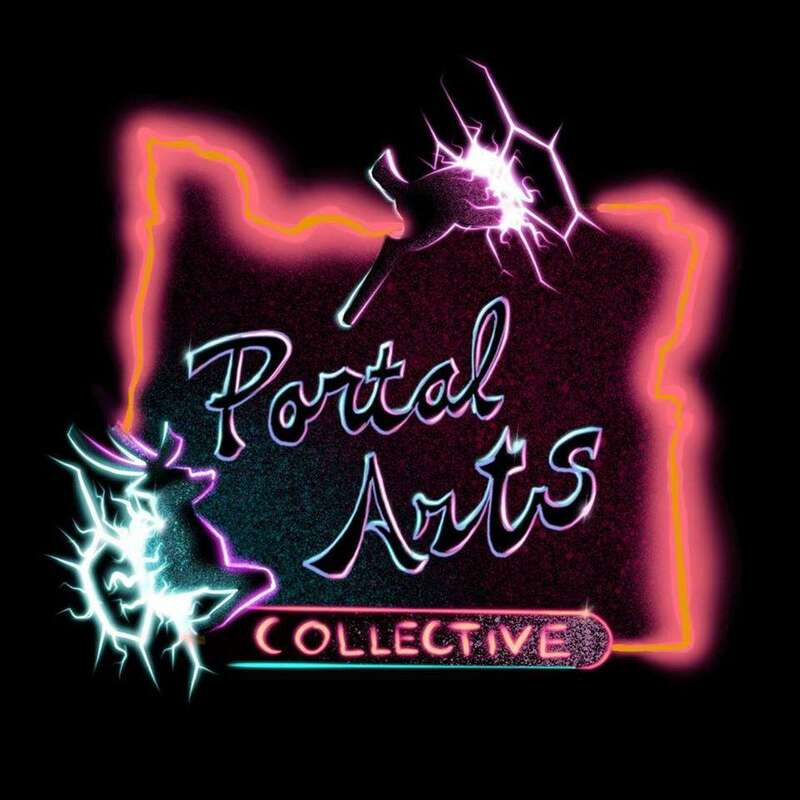 Portal Arts Collective transforms trash into art in order to educate communities about the process of creative material reuse and our environmental impact, advancing a regenerative future that is focused on personal accountability and collective action. Our 501c3 Non-profits founding principle is that the best way to improve our communities, our environment, and our world is by expanding the possibilities of people and facilitating their creative expression. We facilitate community based projects and teach workshops that are driven to engage the public in art that exposes them to new perspectives and connects them with their environment. 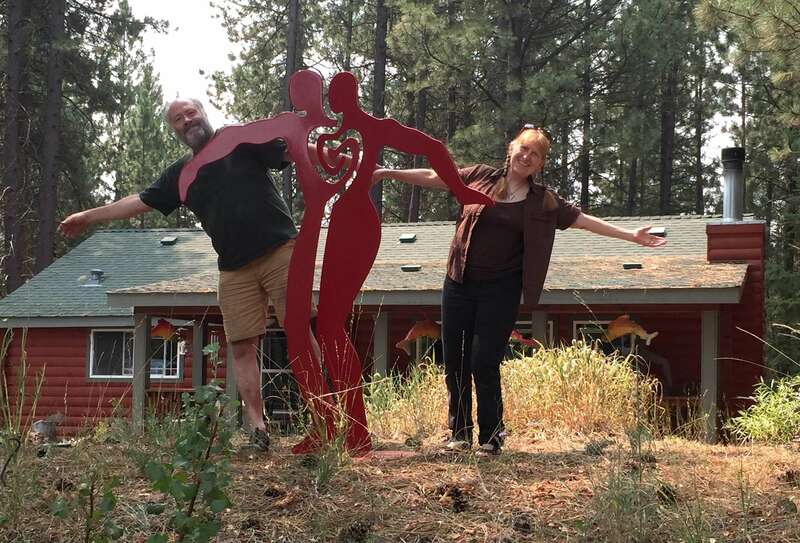 Oregon artists Alisa Looney, and Wade Womack have been creating art together in the Northwest for over 30 years. They grew up in opposite ends of their native state of Idaho, and met in in the middle in the Art Department of Boise State University. They have collaborated in art and life ever since. Recently relocated from Portland, they now call Bend their home, and are loving every minute of it! They have opened riverARTadventures studio, where they create original sculpture, prints and jewelry, and teach classes in drawing, woodblock printing and enamel (glass) on steel. David Sowards-Emmerd After receiving a PhD in Physics at Stanford University, I soon switched from an academic career in Astrophysics to designing diagnostic X-ray, Nuclear Medicine, and MRI systems in the medical imaging industry. Now I’ve moved on and am my own boss at Drunken Marmot Farm and Forge, my one-man and two-dog adventure, creating unique, fully-functional pattern-welded (Damascus) steel tools and cutlery from scratch with hammer and fire, and raising grass-fed beef. Morgan Madison Growing up as the middle of 3 brothers in Denver, Morgan early on sought his own niche and discovered it in art. This led him to a BA in Studio Art from Lewis and Clark College in Portland, OR. Thereafter, a fateful job in the fiery depths of an art glass factory introduced him to the medium of glass, which forms the core of his practice today. Based in Seattle, Morgan employs many different materials, from glass to steel, cardboard to concrete, in order to create work informed by his love of drawing and inspired by the man-made and natural world around us. He draws on these environmental elements to build a vocabulary for exploring the worlds we inhabit and those we build around (buildings) and within ourselves (beliefs). Morgan teaches internationally, including at Pilchuck Glass School in 2016. He has had recent solo exhibitions at Pilchuck in Seattle and Urban Glass in Brooklyn, NY, and has taken part in several residencies, including at the Museum of Arts and Design in NYC and Northlands Creative in Lybster, Scotland. 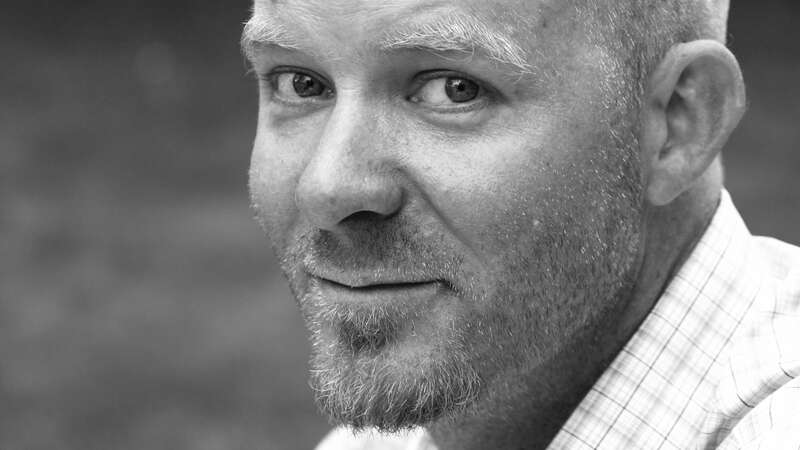 Doug Wagner is the founder and owner of MODERNFAB, a design + fabrication studio in Bend, OR. Steel is the main ingredient for most projects while mixing in other materials. Doug grew up in the midwest and received his degree from the Kansas City Art Institute in Design. Doug has experiences that range into several areas of art, design, furniture and architecture. He is constantly looking at everything, everywhere all the time to understand materials, connections, textures, details, light, objects, nature and anything that can feed the energy of creating. Do you have experience in playing with fire? Submit your own vision for the 2019 competition. The Bend Cultural Tourism Fund is a grant program created to enhance Bend’s economy through engaging visitors with the lifestyle, art and history of Bend. From musical acts to art exhibits to film festivals, the BCTF supports cultural opportunities that draw visitors to Bend. 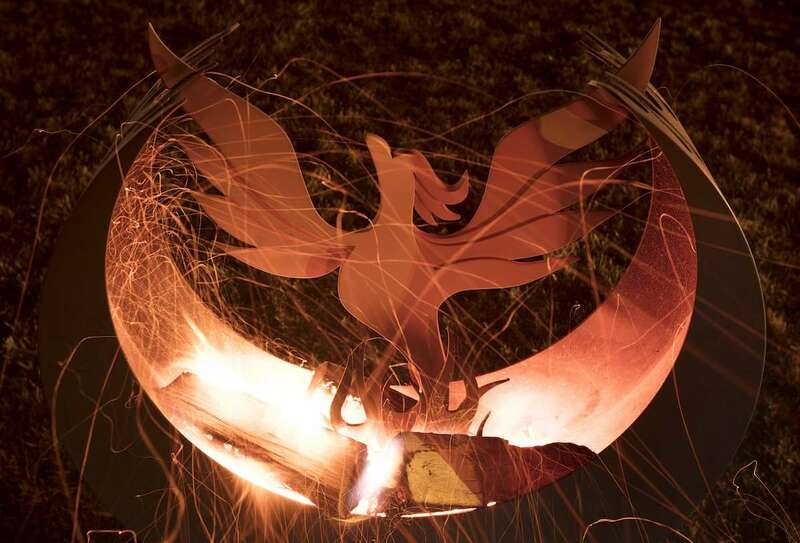 Lay It Out Events is honored and grateful to be the the recipient of a Bend Cultural Tourism Grant, which has funded expanded outreach and marketing for the Fire Pit and Sculpture Competition, contributing to the cultural life in Bend. 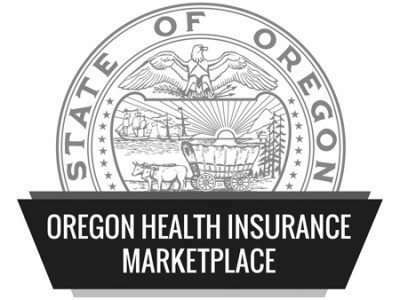 The 2018 competition will showcase submissions from throughout Oregon and Washington in part as a result of this funding. 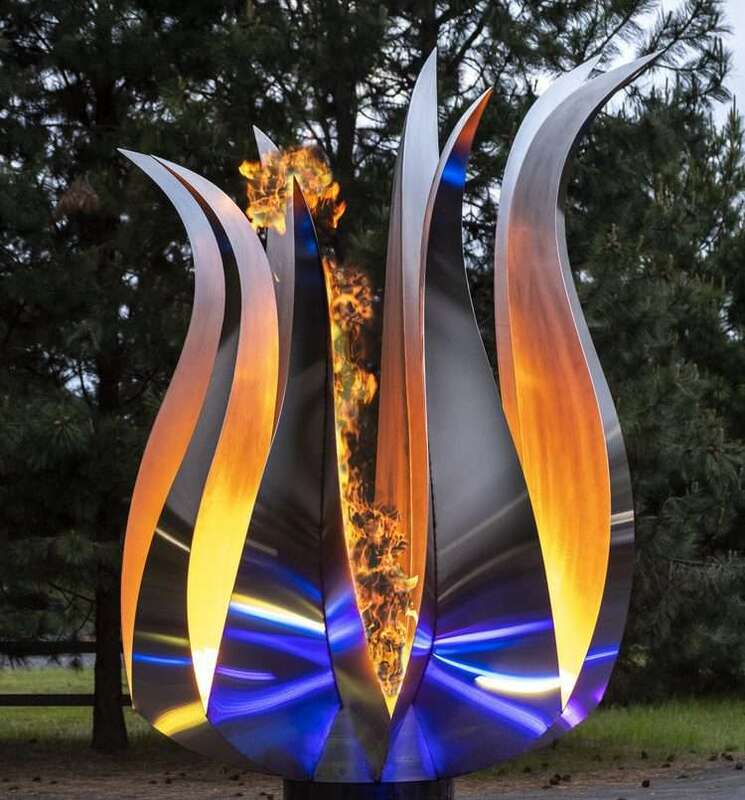 Lay It Out Events is excited to be partnering with the City of Redmond and RCAAP for the first public art placement generated by the OWF Fire Competition. With the advent of Art Around the Clock , Redmond’s outdoor public art gallery, this public placement is part of an ever growing cultural legacy. 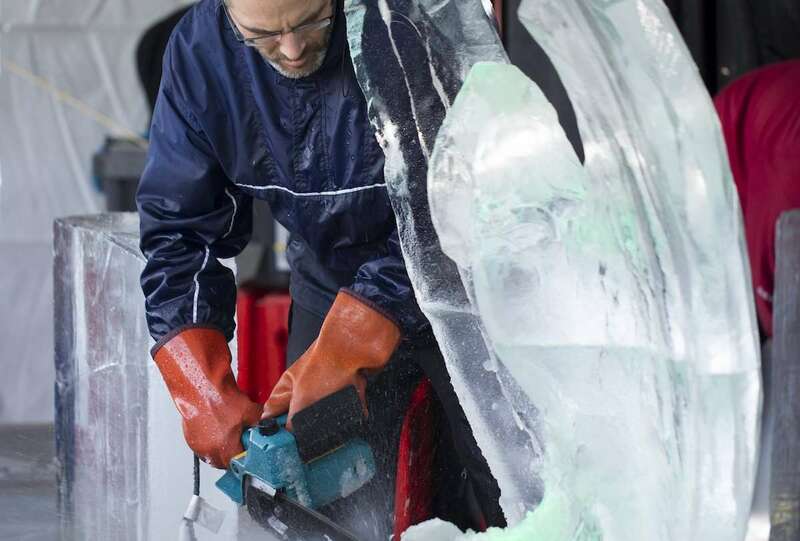 Watch gifted carvers from throughout Central Oregon transform blocks of ice into works of art, showcased throughout the festival on Saturday and Sunday. The ice sculpture programming is sponsored by Hayden Homes, building better communities since 1989. Russ lives in the South End of the Olympic National Forest. 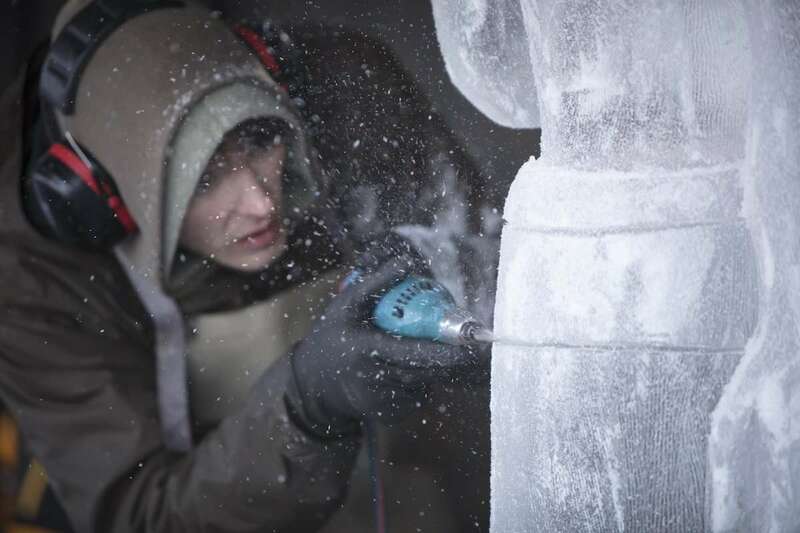 He’s been sculpting everything from ice, snow, wood and pumpkins for over the last 30 plus years. 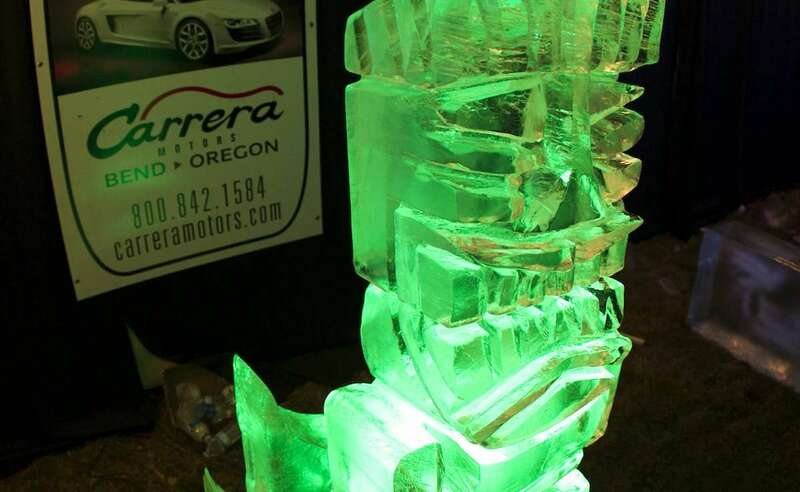 Russ has carved ice in 2 International competitions and many other competitions in Canada and Oregon and Washington State plus numerous carvings for individual and companies. Russ has carved for numerous fairs around the country such as Virginia, Illinois, Texas, California, Oregon, Idaho and Washington. 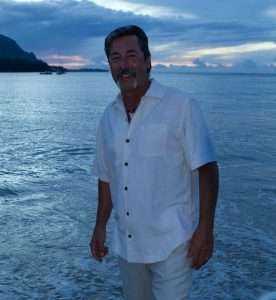 He has been on TV extensively for the Food Network Channel, HGTV, Martha Stewart, Tonight Show and Evening Magazine and has carved for celebrities such as Bill Gates and Vice President Al Gore. 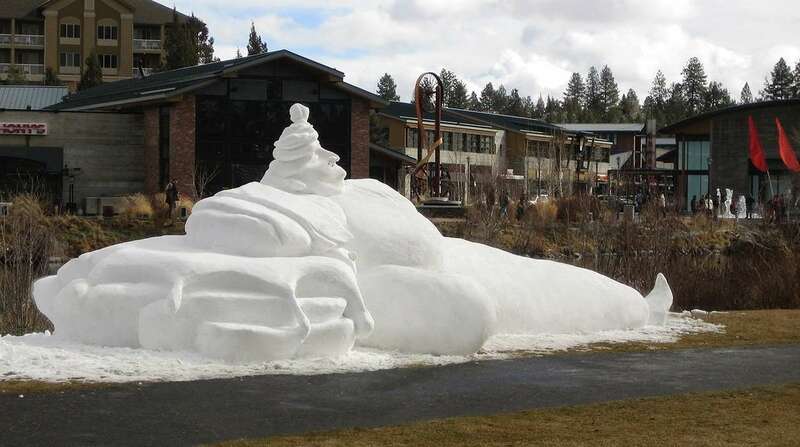 Russ was a member of the U.S. snow sculpting team for 3 years carving in Japan, China and Switzerland. 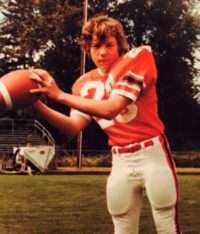 John Stark Born in Gaston Oregon in 1982 and moved to Sisters in the same year. He graduated from Sisters high school in 2000 and began an apprenticeship for his father Paul Stark. After several years working with his father on large scale public installations in New York ,Jon moved back home to Sisters where he has continued to develop his craft. 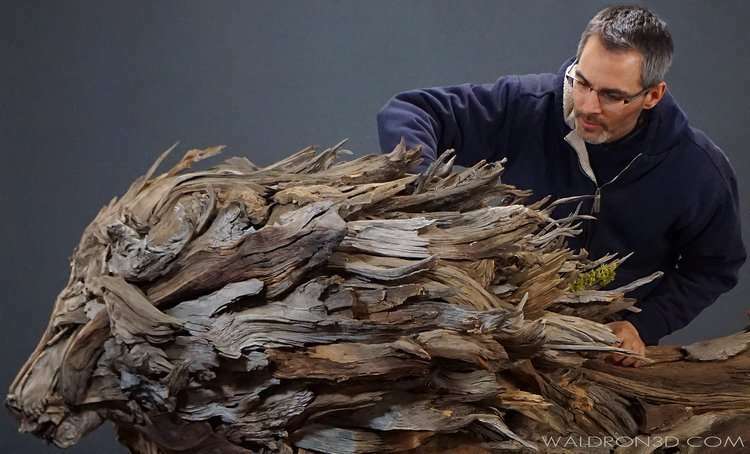 Using mainly locally sourced woods such as Juniper, Ponderosa and Lodgepole Jon Stark creates striking one of a kind sculpture and furniture that reflects his love for the wild beauty that abounds here in central Oregon. Lisa Donze is from Olympia, WA, and has been sculpting for over the last 10 years. She started out sand sculpting through Sand in the City and as her talent grew, she began to have opportunities to add snow, ice and pumpkins to her repertoire. When she’s not carving she enjoys her family and running an insurance agency. 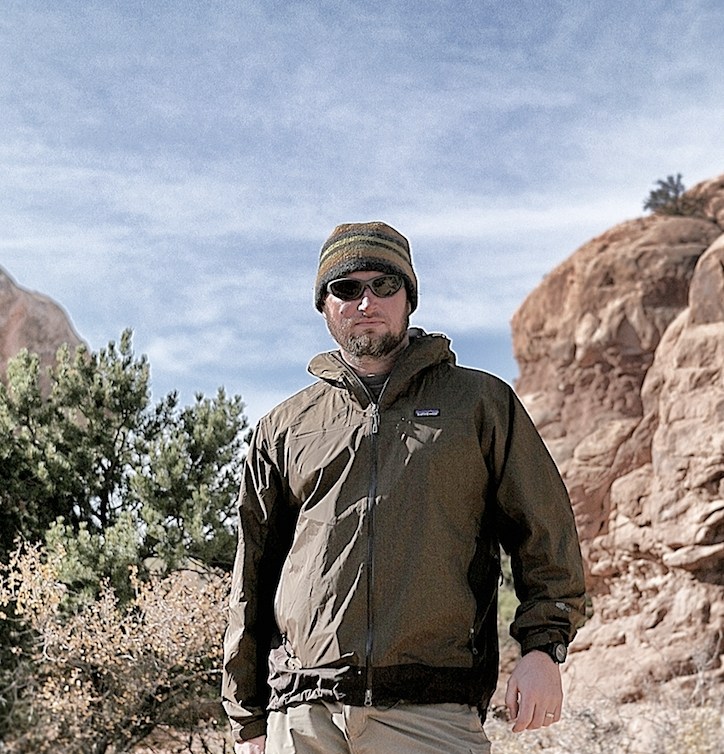 Jason Waldron Growing up in Central Oregon has instilled in me a deep appreciation for community, wildlife and nature. Consequently, I primarily utilize local materials from Central Oregon’s wilderness, recycle\repurpose yards and scrapyards where I find various weathered and worn pieces of wood and metal. A long time Bend resident and recent transplant to Hopewell, Oregon, Lynn Rothan describes herself as a multi media artist. Involvement in the OWF spans many years beginning with “Ali Baba,” a WinterFest snow sculpture! Contemplating the ice carving event has been percolating for many years. She is excited to explore this new medium. 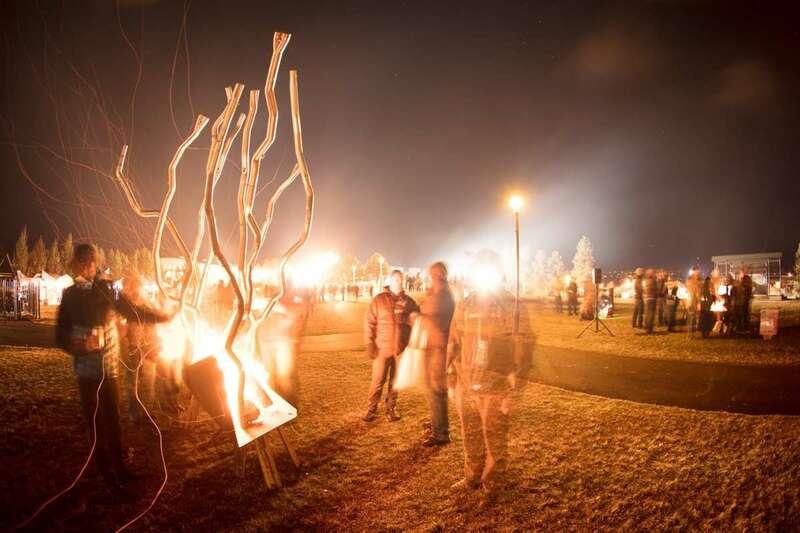 Celebrating 20 years, Oregon WinterFest expands the popular Fire Pit and Sculpture installations with COLA – Central Oregon Light Art. 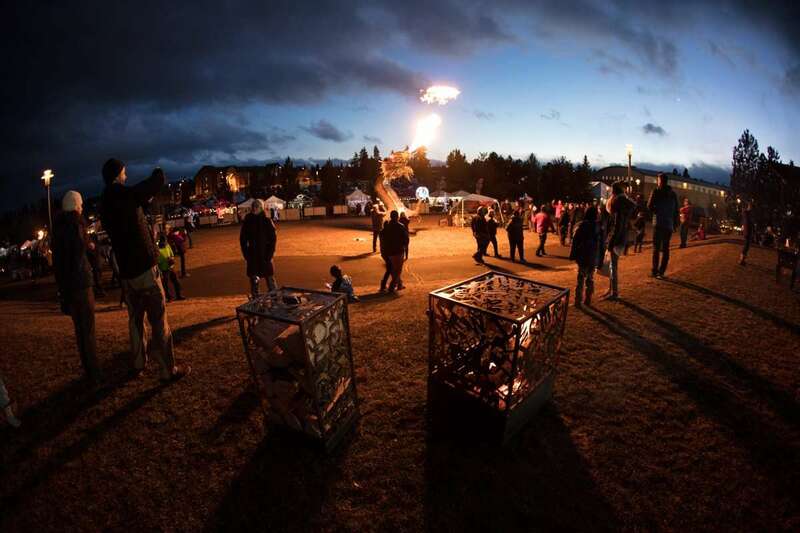 Regional artists will illuminate the banks of the Deschutes river with rich environments and art pieces, all centered around light. Light art is a traditional way to celebrate the night during these dark times of the year, originating when candles and torches were the only source of light. With the advent of modern ways of creatively thinking about light and technology these installations have become focal events in themselves — in Europe, and more recently, in North America. 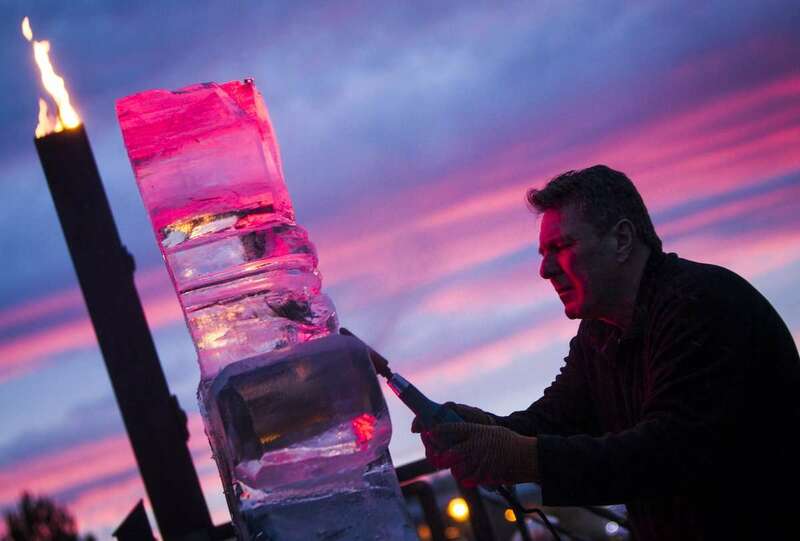 This year, Oregon WinterFest brings this modern tradition to Bend. We are looking for artists and creative thinkers to join us for this enlightened art show. As this is the first show of this kind in the area, no theme has been set. 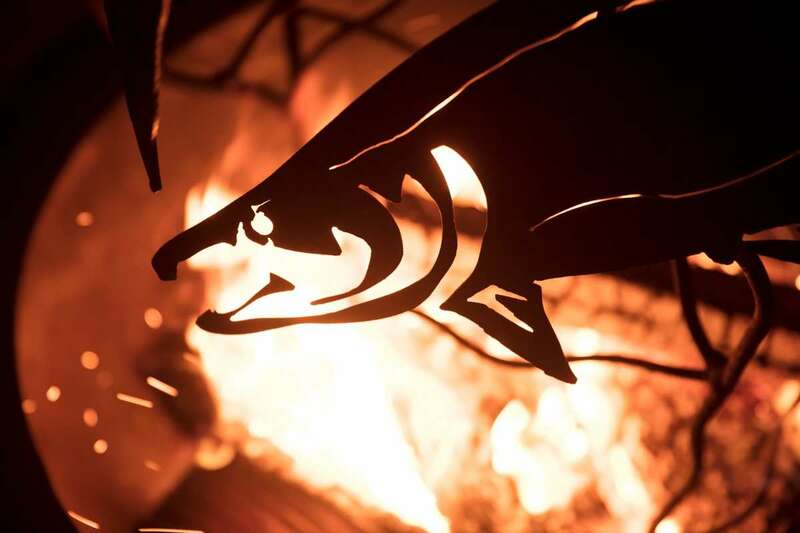 Artists are encouraged to light up the banks of the Deschutes River with their most creative work. Technical support will be available to artists in the creative process. Lloyd McMullen is a mixed media/found object artist. She’s drawn to stories told by homely inspiration: stolen images, misappropriated words and images & random detritus. McMullen brings a lifelong passion for obscure facts, shiny objects and rusting metal, two and three-dimensional paintings/constructions. As a community arts activist, McMullen is sometimes an occasional yarn bomber and instigator of secret art instillations. 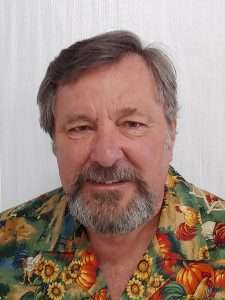 Bill Hoppe teaches art at Central Oregon Community College and has shown his work both nationally and internationally. 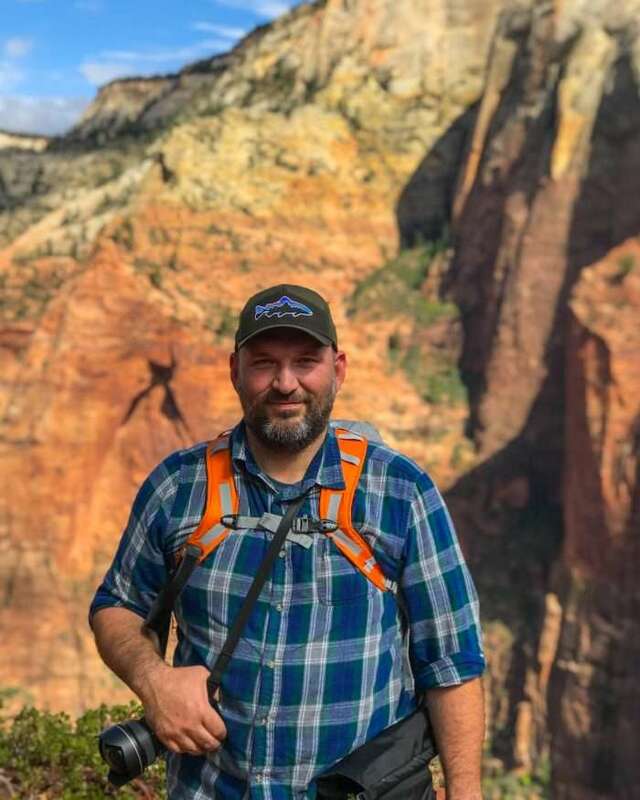 As a past recipient of the Higher Education Teacher of the Year award, his past residencies have included places like Portland, Seattle, New York and San Francisco. Hoppe will be joined by a group of students who worked to create the theme of “Light Lure,” and constructed lantern shapes out of Mylar. The lanterns were then created from repurposed metals. The students participating are Raoul Desibour, Luke Alee, Delaney Pogue and Jack Greathouse. Greg Amanti is a master mold maker, stone carver, and critically acclaimed artist and artisan. He has worked and trained at the two largest foundries on both coasts, and assisted some of the most well-known contemporary artists, including Kiki Smith. His own work has garnered much attention, as well, including an exhibition at the Fort Collins Museum of Contemporary Art, the Hinterland Art Space, The Miami Photo Salon during Art Basel, The Workhouse and The Redline Art Center “Between the Medium Seeing Photographically” during the Month of Photography curated by Mark Sink. Greg was also awarded the “Photographers Forum Award of Excellence”. 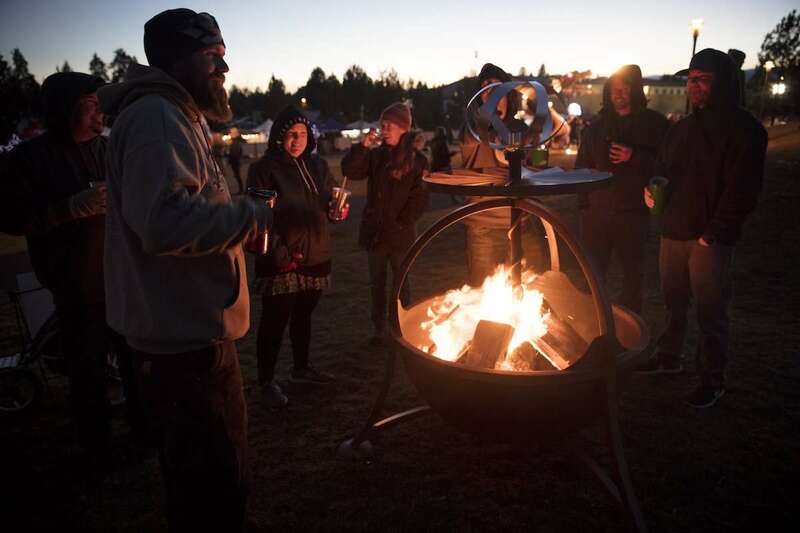 Most recently, Greg has collaborated with the BND DSGN Conference for the 2030 Future Fair Art walk’s Design Challenge as well with the 2016, 2017, 2018 BND DSGN exhibit installation in the LibertyTheater and was one of four judges for the fire pit sculpture contest at Oregon Winrterfest 2018.